This report presents data collected as part of a cooperative study of infiltration and groundwater recharge to the regional aquifer near Victorville, California. The study was funded by the U.S. Geological Survey (USGS) and the Mojave Water Agency. 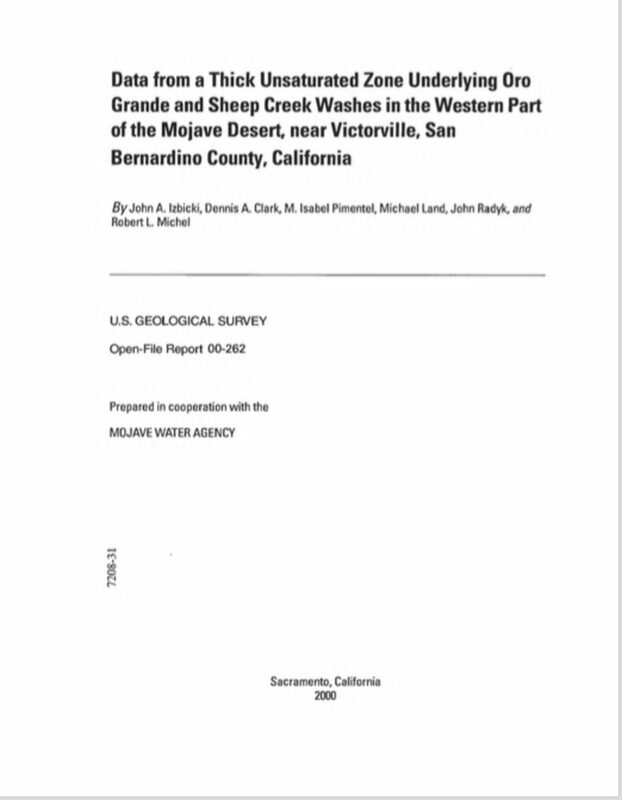 This report contains data on drilling, instrument installation, the physical properties of unsaturated earth materials, and the chemical and isotopic composition of leachate from cores and cuttings, soil water, and soil gas collected at sites underlying Oro Grande and Sheep Creek Washes in the Mojave Desert. The report also presents similar data collected at sites on the alluvial fan near these washes and at a site near Cajon Pass. The sites on the alluvial fan and near Cajon Pass served as controls for the study and allow for comparison with data from previous studies. In addition, the report presents data on the chemical and isotopic composition of bulk precipitation, and on groundwater levels and quality. Interpretation of these data is beyond the scope of this report. 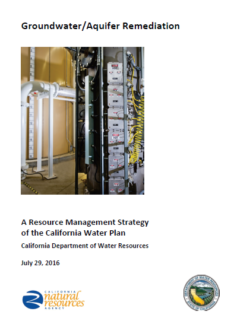 California’s water system is facing a series of challenges affecting water availability, reliability, and delivery. Reevaluating how groundwater is managed is necessary if it is to achieve its full potential as a reliable source of water. 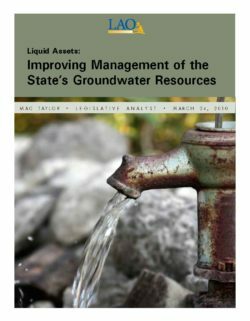 In this report, we present the Legislature with a series of actions that would be phased in over a period of time to address current and emerging groundwater management issues, including bringing science and law together to accurately reflect the physical interconnection of surface water and groundwater. Portions of aquifers in many groundwater basins in California have degraded water quality that does not support beneficial use of groundwater. In some areas, groundwater quality is degraded by constituents that occur naturally (e.g., arsenic). In many urban and rural areas, groundwater quality degradation has resulted from a wide range of human (anthropogenic) activities. Groundwater remediation is necessary to improve the quality of degraded groundwater for beneficial use. Drinking water supply is the beneficial use that typically requires remediation when groundwater quality is degraded. Contaminants in groundwater can come from a many sources, naturally occurring and anthropogenic. Examples of naturally occurring contaminants include heavy metals and radioactive constituents, as well as high concentrations of various salts from specific geologic formations or conditions. Climate change that results in altered precipitation, snowfall patterns, and rising sea levels may exacerbate salt water intrusion and flooding of low-lying infrastructure and urban facilities. These phenomena will add new challenges to protection of groundwater from contamination. In addition, groundwater can be contaminated by anthropogenic sources with organic, inorganic, and radioactive constituents from point and non-point sources. These anthropogenic sources include industrial sites, mining operations, leaking fuel tanks and pipelines, manufactured gas plants, landfills, impoundments, dairies, septic systems, and urban and agricultural activities. The contaminant having the most widespread and adverse impact on drinking water wells is arsenic, followed by nitrates, naturally occurring radioactivity, industrial/commercial solvents, and pesticides. Groundwater remediation removes constituents, hereafter called contaminants, which affect beneficial use of groundwater. Groundwater remediation systems can employ passive or active methods to remove contaminants. Passive groundwater remediation allows contaminants to degrade biologically or chemically or disperse in situ over time. Active groundwater remediation involves either treating contaminated groundwater while it is still in the aquifer (in situ) or extracting contaminated groundwater from the aquifer and treating it outside of the aquifer (ex situ). Active in situ methods generally involve injecting chemicals into the contaminant plume to obtain a chemical or biological removal of the contaminant. Ex situ methods for treating contaminated groundwater can involve physical, chemical, and/or biological processes. A new era for California’s groundwater began in September 2014 with the passage of the Sustainable Groundwater Management Act (SGMA). SGMA established a path for the sustainable management of groundwater through the formation of locally organized groundwater sustainability agencies and locally developed groundwater sustainability plans. 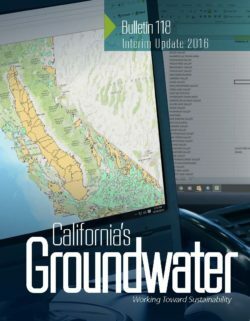 The purpose of this interim update is to provide up-to-date information on groundwater basins subject to critical conditions of overdraft, groundwater basin boundaries, and basin prioritization. 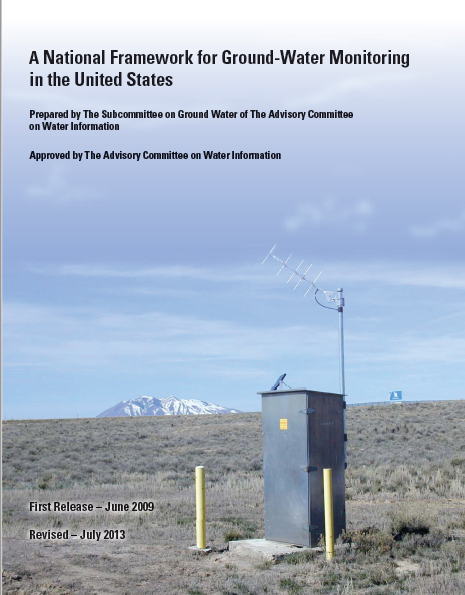 That information is essential to the successful implementation of SGMA, including the timely formation of groundwater sustainability agencies and the development of groundwater sustainability plans.